Electrical contractors will be interested to hear the latest proposal by the Department for Transport. The government’s “Road to Zero” policy has been well publicised, with an ambitious aim of reducing vehicle emissions in the UK to nil by 2040. The policy will ban the sale of all petrol and diesel cars and vans by 2040, aiming for road users to replace their fossil fuel engines with hybrid and electrical vehicles. However, with sales of these vehicles making up only 5.5% of the current market, we are a long way away from fuel-free roads. A recent survey by the AA revealed that eight out of 10 drivers see the lack of charging points as a stumbling block to buying an electric car. The RAC has also completed research showing that the current public charge point network is “unattractive to use and is unsuitable for encouraging the next wave of EV customers”. In response to these concerns, the Department for Transport has released a new proposal; all new houses, flats and office buildings in England are to come with external charging point installations. What does this mean for electrical contractors? It is private electrical companies who would be charged with the development and installation of charging points, in a project which would cost up to £400m. If successful, this proposal will open up a whole new business opportunity for electrical contractors looking for a slice of a market estimated to be worth up to £7.6 trillion by 2050, according to Transport Secretary Chris Grayling. And with house-building targets set at 300,000 a year this sector could explode if the proposal goes ahead. The NICEIC and ELECSA have an Electric Vehicle training course available for those interested in expanding their business. Those ahead of the curve are still in low numbers; in Wales only 24 Welsh electrical contractors are listed and for the South West there are only 38 qualified contractors. You can find a list of all electrical contractors currently qualified to install charge points on the NICEIC website . 80% of EV owners currently have access to home charging but if homes and offices came with chargers ready-installed then we could see EV owner numbers rise dramatically as the deterrence of re-fuelling difficulties becomes a thing of the past. So with the biggest overhaul in road transport technology in 130 years coming, it’s time to consider whether your company is electrical vehicle ready as UK streets become electric avenues. These days construction sites take their health and safety very seriously, and with good reason. Whilst the situation has improved massively in the last 20 years, construction still accounts for 27% of fatal injuries to employees in Britain. Sites want to know that their workers are informed and prepared for the risks they may encounter, which is why more and more are placing value in construction training and certification. Whilst the words health & safety don’t get most of us fist pumping the air excitedly, for employers these courses are becoming on-site essentials. The good news: they are a doddle to complete, make your CV and profile look great and help you to stand out from the competition. They all cost under £25.00. Gone are the days of sitting in a windowless classroom for 8 hours, watching Powerpoint presentations and instructional videos. E-Learning has brought training into the 21st Century and is accessible from your mobile or desktop, meaning you can complete it on the go. Some of the courses take as little as half an hour to complete. It gives you a valuable certificate that will last from 1 to 3 years. So what’s stopping you? Asbestos Awareness comes in at number 1 on our list. It is a legal requirement for any employee who might accidentally come into contact with asbestos as part of their work to have certification, so we consistently get asked for this as a priority. Another top pick for construction sites. This course gives an introduction to the general hazards and safety measures involved in working at heights. This includes ladder safety training , use of access platforms and fall protection training. Anyone who has seen Jurassic World knows the importance of this one. But seriously, 49% of fatal construction injuries in the last five years were due to falls from a height. In 2016/17 25 people died from this. Those figures don’t even take into account accidents that result in injury. If you’re going to be working at heights it’s something you should definitely be considering for your own protection. Manual handling is any task involving supporting or transporting any load by human effort. It is one of the most common causes of injury at work and causes over a third of all workplace injuries. No matter what your trade, it’s likely that you’ll be doing some sort of heavy lifting or moving. Whilst most employees will have been some sort of guidance on manual handling, it’s important to have a regular reminder as one false move could mean looking like this every time you put on your socks. We are very proud to have been involved in the regeneration over the last four years of The General in Bristol. It has recently been visited by George Clarke of Amazing Spaces who was impressed by the transformation the building has undergone. You can see the before and after in the videos posted below. Originally opened as the Bristol General Hospital in 1858, the building cost a grand total of £28,000. Much of the funding came from local workers who gave a penny a week towards building and running costs. The hospital closed its doors in 2012 and City & Country snapped up the opportunity to restore the Grade II listed building to its former glory. A hodge podge of characterless 20th century extensions and repairs to extensive WWII bomb damage had faded the renaissance grandeur of the building. The architectural restoration has won City & Country a host of awards, including Heritage Property of the Year in the Michelmore’s Property Awards and the 2017 South West RICS Award for Building Conservation. Our client Weston Electrical Services Ltd are carrying out the full mechanical and electrical installation to the apartments and infrastructure of the building for which we have supplied a wide range of skilled operatives. When finished, the building will incorporate 205 one to four bedroom luxury apartments and houses. We have also assisted Weston in completing the M&E design and installation of a waterside restaurant complex which includes the Michelin starred ‘Casamia’, located beneath the apartment building. Since October 2014 we have filled 148 placements for the site supplying roles across the M&E spectrum; from mechanical contractors and engineers, pipefitters and plumbers, to electricians & electrical testers. The skilled mechanical and electrical work of our operatives has helped bring modern comfort and convenience to the homes. All feature intruder alarms and mains operated smoke detectors with internal cabling installed for terrestrial television. Other mod cons include video activated door entry and radiators or underfloor heating powered by a communal heating system. All this is an impressive task in a listed building split into 205 units! We are excited to see the conclusion of the project and the difference it will make to the BS1 area of Bristol. Watch below to see the incredible before and after effect that this restoration has had on the building. After the excitement of Christmas and New Year, the next event on the calendar is a bit more dismal; Blue Monday, the most depressing day of the year. And with rain in the air and the Carillon news in the media, it is a blue day for us indeed in the construction industry! On the third Monday of January each year, it has been calculated that we are at peak grumpy, due to a combination of factors including the weather and looming Christmas debt. But here in the Pier office we have decided to try and cheer things up a bit. It so happens that this year Blue Monday coincides with a holiday from over the pond; in the US it’s National Strawberry Ice cream Day. So never missing an opportunity for a snack, we have decided to combine the two together in an effort to beat the January blues, wearing colourful clothes to brighten up the office and eating ice cream to brighten up our outlook. Sophie enjoying her ice cream despite it being cold enough to wear her coat indoors! For all of you that are feeling a bit glum today, we’ve compiled a list of construction jokes in an attempt to cheer you up. Mostly about electricians. Sorry electricians. I never wanted to believe that my Dad was stealing from his job as a road worker. But when I got home all the signs were there. Do you want to hear a construction joke? Oh, sorry I’m still working on it. Q Why do engineers enjoy fixing steelwork together? Q How do construction workers party? A They raise the roof! Q How many safety inspectors does it take to change a light bulb? A Four. One to change it and three to hold the ladder. Q Why are the electricians always up to date? Q What kind of car does an electrician drive? Q What’s the difference between an Electrician and God? Q How many welders does it take to screw in a light bulb? A Nobody knows; it’s not in their job description. Q What do plumbers have when they fall asleep? Q How many plasterers does it take to change a lightbulb? A None, that’s a sparky’s job. A man at a train stop shows off pictures of his three sons to a friend. “What do your boys do for a living?” asked the friend. “Well, my youngest is a neurosurgeon and my middle son is a lawyer”. “What does the oldest do?” asked the friend. The father replied “He’s the plumber that put them all through school”. Happy New Year everyone! Following our playlist dedications to electrical workers and plumbers, our latest list celebrates those in construction jobs; our Trades and Labourers in Wales and the South West who are working for us out in the January cold. We are trying to cheer you up before next Monday, as the 15th January is officially the most depressing day of the year, known as Blue Monday. Blue Monday falls on the third Monday of January each year. A range of factors come into the science of pinpointing this day as the worst in the year. Gloomy weather, failed New Year’s resolutions, debt level after Christmas and a general lack of motivation all add to the post-Christmas blues (In case you were wondering, there are 344 days to go). In the post-festive season everyone needs a bit of cheering up. Typical remedies recommended are exercise, companionship and being kind to others. Maybe you could try offering to do the tea round on site? We are feeling particularly sympathetic to our workers in this nippy January cold so a special shout out goes to our labourers and traffic marshals who are in the great outdoors this January. We thought we would try to cheer you up with some appreciation of what you do. What better than a themed playlist to warm your cockles! So this list is dedicated to our Builders, Labourers, Bricklayers, Groundworkers, Scaffolders and Equipment Operators who face the Winter weather for us. Also our Joiners, Painters, Plasterers, Carpenters, Dry Wallers who keep our homes cosy, we salute you! If you want to auto-play the list then you can find it on our Youtube channel. So as a little nod to those that keep us warm over Winter we have themed our playlist for this week as a dedication to Plumbers, Pipefitters and all the other mechanical workers who do great work for us on site. This one took a little longer to put together than the Sparky’s playlist…apparently there aren’t so many songs about plumbing, pipework and gas installation as there are about electricity and light…surprising that. The selection is also a bit eclectic to fit the theme…you don’t often find Katy Perry and The Prodigy in the same place rounded off with a Tom Jones classic! A week before the 25th we felt we had to put a little festive cheer in to round the playlist off though and no-one can do it better than Tom! We hope you enjoy the musical roundup! And watch this space for more construction jobs themed music. Click here to listen to our playlist on Youtube or play the songs below. With the snow falling outside it’s beginning to look a lot like Christmas. In the Pier office the tree went straight up on the 1st December and the 600-strong pile of Christmas cards is making its rounds to be signed. In fact, it’s felt pretty festive in the office since early November when the radio was permanently tuned into the Christmas channel. Some of us may feel that the season to be jolly has gone on for far too long. There are only so many times you can listen to Mariah Carey telling you what she wants for Christmas before you have to take things into your own hands. So we’ve put together some Construction-inspired compilations to change things up a bit from the endless festive cheer. Influenced by Simon Mayo’s Oldies songs on his Radio 2 Drivetime show we’ve had a bit of fun making industry-themed playlists. This week it’s ‘Songs for Sparks’, dedicated to our hardworking electricians, electrical mates and supervisors and to anyone else who works with wires, plugs and boards! And we’re not biased; the other trades will be getting a look in with their own dedicated playlists coming soon. Construction apprenticeships and training: new schemes enough to plug the skills gap? Why is there a skills shortage? The release of the Autumn Budget and an overhaul of construction apprenticeship and training programs has brought attention to the chronic skills shortage in the construction sector. After the loss of an estimated 400,000 skilled workers in the financial recession the industry remains on a back foot. In the CITB’s latest report on Skills & Training they revealed that 20% of business said they had skills gaps in their existing workforce, up by 12% compared to the last report. This shortage is only set to increase as Brexit looms and the industry depends on an ageing workforce. Research published by the Office of National Statistics shows 24% of UK construction workers aged 45–54 are set to retire in the next 10-20 years. And this ageing workforce is not being replaced. What is being done to plug the gap? The Government has launched a number of initiatives in recent years to try and address this problem. Construction apprenticeships, the traditional mainstay of skilled labour supply, have been given a boost. A new government target of 3 million new apprentices by 2020 has been announced. £34 million has been earmarked solely for construction training. The Apprenticeship Levy came into force in May, estimated to raise £3bn a year so that employers can take ownership of training, with at least 90% of the funding being supplied for smaller employers. Aside from the traditional apprentice route, other training methods are being developed. The newly announced National Retraining Scheme aims to retrain adults for new professions. ‘T-levels’ will streamline 13,000 qualifications into 15 good quality technical qualifications to rival the existing A-levels. How effective are these measures? Recent DfE figures show that the number of apprenticeships fell by close to 60% in the quarter since the levy commenced. There has been widespread criticism of the scheme’s complicated framework. Many employers are facing challenges accessing the financial resources and are even delaying the start of apprenticeships, resulting in calls for reform. These teething issues could cause setbacks from the start to the 3m target. In the short term these measures are unlikely to provide an immediate solution. As we potentially lose our stretched workforce to retirement and Brexit in 2019, many training schemes may not begin until 2020 so it may be a case of too little too late. The next decade could be a difficult time for our sector if we cannot meet demand. How do we future proof the industry? Despite these issues, the renewed focus on construction apprenticeships and training is vital to the future of the industry. The sector deal has been welcomed by associations that consider investment and training to be at a critical point. These are all positive steps towards securing a skilled and stable workforce. The trailblazer apprenticeship schemes have been met with widespread industry approval. Partnering companies to create construction apprenticeships, they ensure the quality and relevance of training and ensure the right sectors are being developed. Similarly, the levy concept was built around the need for employers to take control of training to ensure that it is high-quality and relevant. It makes sense to supply the industry with the tools to deliver the apprenticeships and skills it sorely needs. Once awareness of the scheme and the application complications have been improved the levy will be a vital resource for the industry’s future. In the long term the sector will need to embrace the digital revolution that will be a vital lifeline for the centennial generation workforce. Innovations in materials, offsite modular construction, and BIM modelling to name a few could help attract a tech-savvy workforce. The construction industry must work to develop an image away from the hard hat and the building site, embracing innovation, diversity and expertise if it wants a strong future. Since the Autumn budget was announced by Phillip Hammond a week ago we have been reflecting upon the statement and its impact on the construction industry. You may remember that at the dissolution of Parliament back in May some key trade associations announced manifestos for their election wishlists. The Federation of Master Builders (FMB) had released a five point manifesto focusing on ensuring supply of skilled workers, increasing supply, quality & energy efficiency of new homes and boosting growth among SMEs. Correspondingly, the Electrical Contractors’ Association (ECA) & Building Engineering Services Association (BESA) grouped together to create their own five point plan. Energy efficiency, apprenticeship training and financial support for SMEs were common themes. £34m of funds have been ring fenced for construction training. Responding to requests to increase the quality of training, the introduction of T-levels and the launch of the National Retraining Scheme show a commitment to technical education. SMEs will be supported through an extra £1.5bn for the Home Building Fund. The apprenticeship levy should raise £3bn a year to help finance smaller operations. Whilst not every point has been addressed, overall the industry response to the budget announce has been positive. Brian Berry, Chief Executive of the FMB even lauded it a ‘budget for builders’. Whether this will give the industry the boost it so needs remains to be seen. Brexit was clearly at the forefront of most budget decisions. With 8% of the UK’s construction workers being EU nationals, the real test will come in May 2019. In the office today we have been reflecting on how far we have come and our achievements since we were founded. With Paul Ingram at the helm we have introduced new departments to the business, broadening our offering to clients. This has resulted in the need to double our staff. Since 2013 we have established a new apprenticeship scheme, playing a part in increasing the number of skilled workers in the building services industry (where there has been a significant shortage). We also founded a subsidiary company Pier Resources & Training to provide easy access to training courses & certification for our clients & workers. In 12 years we have developed relationships with nearly 500 clients in the Construction and M&E industry. Pier has built a strong database of over 28,000 candidates across England and Wales. We have grown our business across the bridge from Cardiff. We are now making a name for ourselves on sites as far as London, Plymouth, Cornwall, Oxford, Bristol, Scotland, Swindon, Nottingham, Bath, Gloucester & Cheltenham to name a few new areas. In 2016 we featured on the Fast Growth 50 list for achieving 90.7% growth between 2013 and 2015. Since 2013 we have filled over 37,000 time sheets totalling a staggering 1.4 million hours of work for our recruits! We are proud of what we have achieved to date and excited for what 2018 and beyond may bring! Last weekend, Llantwit Major under-8s travelled to St Albans in Cardiff to take on the host St Albans and Llandaff North. The squad is growing with confidence each week and improving with every game. They took on what seemed like bigger opposition in size but this didn’t phase the quick running fleet of foot Llantwit players who all played with a smile on their faces. Out of five games played in a round-robin by the Llantwit players only one was lost and that can be put down to early morning rustiness which soon passed. ( I do apologise if I missed out any try scorers). Tilly Godsell was not letting anyone past her to score a try and tagged at will; Seb Gant was like an octopus with his four tag streak straight after each other leaving the opposition and parents bewildered. try scoring but backed this up with some superb passing and tagging, Lucas David continued to grow in confidence and was everywhere in support of tagged players looking for the ball and passing it on, Rhys Evans strong in defence organising the line and passing well to the team. Mefin Lovejoy was again popping up in different areas tagging players unexpectedly, Jack Lewis was an ever-present in support play and made some smart runs foxing the opposition and finally Luca Wilson made his present felt with some excellent tagging and support play reading the games well. Special thanks go to David and Tony for giving up their time on Sunday morning to allow the children to enjoy the sport of rugby and also a good luck to Tony who will be missing from the next game as he is running the Cardiff Half Marathon. Thank you to all the parents also for being the taxi drivers on a Sunday morning which is no mean feat in itself. This coming Sunday Llantwit Major welcome Bryncethin to the Rec for a 10am kick off. The under-8s would like to extend their sincere thanks to Pier Consulting and Davey Daw Builders for their continuous support and sponsorship of mini and junior rugby in Llantwit Major. Towards the end of 2016, Pier Consulting underwent a rigours audit with external auditors EXOVA. The audit consisted of a number of key commitments in how we supply labour to the Building services Industry, resulting in our application being accepted. The Alliance has been established by (BESA) The Building Engineering Services Association as a unique grouping of employment agencies which supply personnel to contractors across the building services engineering industry. Formation of the Alliance recognises the increasingly important role that employment agencies are playing in the sector’s supply chain – along with a need for clear standards by which our performance can be judged. This places us at the vanguard of developments in industry manpower matters which the Alliance represents, the alliance is continually striving to help its members differentiate themselves in the market place as agencies which can demonstrate that they conduct their business according to the professional standards demanded of Alliance membership as distinct from those which are unable to meet the necessary quality criteria. This is another added accreditation to our business, that we are proud to have gone through and adds to the robustness of our business going forward into 2017 and beyond. So last week we received an email confirming we have a place in the 2016 Fast Growth 50 List! To say we are excited and overwhelmed is an understatement, we are absolutely delighted! to have received a place, in this years list, and would like to thank all of our loyal clients and workers, and our staff who work very hard here at Pier, as without all of these good people around us we would not have achieved a place. Just as we thought we couldn’t get more excited we have also been shortlisted for the fastest growing Welsh firm in recruitment services 2016!! the Fast Growth 50 project will be holding its 18th Fast Growth 50 Gala Dinner on Friday, October 21st 2016 at the Mercure Holland House Hotel in Cardiff. It will be hosted by Sian Lloyd from BBC News and our keynote speaker will be the Secretary of State for Wales, the Rt. Hon Alun Cairns MP. It will begin with a drinks reception at 6.30pm followed by dinner, which includes the award ceremony to celebrate your achievements and opportunities to network until the early hours of the morning. As soon as we know the results we will let you all know! Today Friday 20th November we celebrate 10 years in business!! Pier Consulting has now been supplying construction operatives across south wales and the south west today for the last 10 years, the company founded by Philippa George, and Glyn George in 2005 has grown from strength to strength over the last 10 years, providing temporary & permanent labour to the Construction Industry, now concentrating on 5 main areas of recruitment for the construction sector Trades & Labour, Management & Technical, M&E Building Services, M&E Flexible & Apprentices and Engineering and added further value to its recruitment business in 2014 by creating Pier Resources & Training Ltd, which provides support to our existing and new client base with bespoke payroll and training solutions. The office celebrate the 10 year milestone with small tea party today, all directors want to thank all of the staff for an amazing amount of achievement throughout the last few years especially throughout 2015 where their hard work and dedication has really paid off here’s to the next 10 years!! We have also been able to provide support to 2 further Mechanical apprentices who’s apprenticeships were in danger of lapsing, so Pier stepped in and took them over until we could find them a permanent placement to continue their apprenticeship with a new employer. We are committed to playing our small part to increase the numbers of skilled workers in the building services industry and have set ourselves some ambitious target, in partnership with BEST the apprenticeship delivery arm of B&ES, who we have an agreement with to deliver apprenticeships to the Building Services Industry. Wales Online, Local Press, Recruitment Press and the Tabloids have recently highlighted adverts used by a Company called “Pier Recruitment Agency Limited” on their social media accounts which caused controversy in the Industry that many people felt to be tasteless and unprofessional. Unfortunately for us our recruitment business has similar name (Pier Consulting ltd) and already we have had a number of calls from concerned clients, candidates and the media mistaking us for the company in the news. We would like to clarify that Pier Consulting Limited has no connections at all to Pier Recruitment Agency Limited. We adhere to all legislative requirements and pride ourselves on our reputation and expertise gathered over 50 years of combined experience operating for 10 years in the Construction Recruitment Market supporting our valued clients and Workers. We are a member of the national professional body for recruiters in the UK, the Recruitment and Employment Confederation, and adhere to their code of conduct which sets the highest standards for ethical behaviour in recruitment. Recruitment is a people business, trust is paramount to our success. We really hope jobseekers and employers in Building, Housing, Construction, M&E Building Services and Engineering Industries don’t confuse us with the company whose adverts have come in for considerable criticism. The National Minimum Wage rate per hour depends on your age and whether you’re an apprentice – you must be at least school leaving age to get it. The rates are usually updated every October, so the current rates apply from October 2014. From April 2016, the national living wage will be £7.20 an hour for workers aged 25 and older. The minimum wage will still apply for workers aged 24 and under. It’s a criminal offence for employers not to pay someone the National Minimum Wage or to falsify payment records. Employers who discover they’ve paid a worker below the minimum wage must pay any arrears immediately. Use the National Minimum Wage calculator to work out arrears. HM Revenue and Customs (HMRC) officers have the right to carry out checks at any time and ask to see payment records. They can also investigate employers, following a worker’s complaint to them. If HMRC finds that an employer hasn’t been paying the correct rates, any arrears have to be paid back immediately. There will also be a penalty and offenders might be named by the government. It’s the employer’s responsibility to keep records proving that they are paying the minimum wage – most employers use their payroll records as proof. All records have to be kept for 3 years. Pier Consulting, now has a trademark. As the construction sector continues to grow at an incredible rate, Pier touches on the impact the skills shortage is having on the industry and for the M&E industry it serves how they can assist with trying to do their bit for Apprentices, the skills shortage, and associated construction training. Read the full story published in the Bristol Business Post this week. 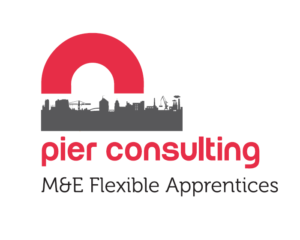 Pier Consulting are proud of what they trying to achieve within the Building Services industry by offering its clients a new way of recruiting apprentices. Pier are trying to do their bit for the industry wide skill shortage, still early days with the “flexible apprenticeship scheme” but Pier have great expectations that by the time college comes around again in 2016 they will have hit their target of having 20 M&E apprentices out in the field. Pier are proud to be working with Bouygues UK and wish them continued success. Pier Consulting have appointed a new Health & Safety Advisor in order to ensure both that our Health & Safety polices are up to date with current and ever changing legislation, and that Pier’s duty of care to its entire temporary workforce is effectively communicated to our staff, workforce and clients. Pier have partnered with Andrew Warring of Green Hat Consulting Ltd. who personally delivers strategic and practical services and advice. Drawing on his 20 years of experience in the construction industry, Andrew will work in collaboration with Pier to underpin our Health & Safety obligations and to provide the reassurance, time and resources we need in order to safely and effectively fulfil our contractual role. He is a member of IOSH, CIOB and the CMI and holds a Post Graduate Certificate in Sustainable Leadership. Andrew reviews our existing health, safety, quality and environmental procedures against specific industry standards and implements improved, compliant practices that reinforce our credible and professional values. We believe that this appointment will be of great benefit to our businesses and our clients. Pier MD, Paul Ingram, confirms that this collaboration reinforces our continuing commitment to our clients and colleagues in the construction industry. Alongside the recent introduction of free personal accident insurance for every worker on assignment for Pier, Andrew’s appointment highlights the importance we place on the Health and Safety of each individual. The team at Pier are working hard to ensure our business is a compliant, and ‘SAFE RECRUITER’ to be used by our clients and workers. We look forward to working with Andrew and the team at Green Hat Consulting Ltd.
Pier have gained a place on the supply chain with Advantage XPO to assist with the recruitment of Blue Collar Operatives, This will see Pier working with them on vacancies for one of the blue chip clients they are the “managed service provider” for. This adds to a number of our recent client wins, and the whole team at Pier are looking forward to delivering Construction and M&E trades to the businesses. Advantage xPO is part of the Advantage Resourcing group, which is among the ten largest global staffing firms. Advantage specializes in providing contingent and permanent workforce solutions in the following recruitment areas: Engineering/Technical, Information Technology, Scientific, Finance/Accounting, Human Resources, Clerical and Light Industrial. With over 250 offices internationally, the group’s 7,000 customers include many of the world’s leading banking, technology and industrial companies. Advantage manages 30,000 temporary staff worldwide, and directly employs over 2,000 people with locations in the U.S., U.K., Japan, Australia, Singapore, China and satellite offices in Poland and Dubai.